Tomorrow will mark the first day of summer for me. My oldest son will have his last day of school and I will no longer have to do the daily running out the door before we are late for school routine (at least for a couple of months). Plus there will be trips to my in-laws house and peace and quiet for me for at least a few days. I might actually be able to catch up on some reading and get ahead on blog posts. However, my oldest claims that I am a mean mommy since I insist on work books throughout the summer months. I have high expectations for my children and I hate the idea of them losing knowledge through the summer. Another sign of summer in my house is the arrival of lots of seafood dishes. My kids are big fans of shrimp and I try to make it at least once every couple of weeks, especially during the warmer months. Last week I tried a new recipe for Spicy Shrimp Marinara from the Everyday Food insert of Martha Stewart Living magazine. This recipe has three ingredients in the marinara and five in the main recipe. It takes 10 minutes of total time (not including the time to make the marinara), all of which is active and makes 4 servings. I did make a few changes to the original recipe. First since I was serving 6 people (my in-laws were in town) I doubled the recipe. I also chose to leave out the red pepper flakes and add them at the table for individual servings. My father-in-law doesn't enjoy spicy foods, so doing the red pepper flakes in this manner allowed everyone to eat the recipe. I served my portion over gluten free ziti and the rest of the servings over spaghetti for the remainder of my family. Everyone that tried this recipe loved it. The flavors were delicious and the recipe is beyond easy. I allowed my garlic to caramelize, which created a nice undertone to the dish. For anyone trying this recipe I would suggest doing this modification as well. This is a nice simple recipe that would work well year round. 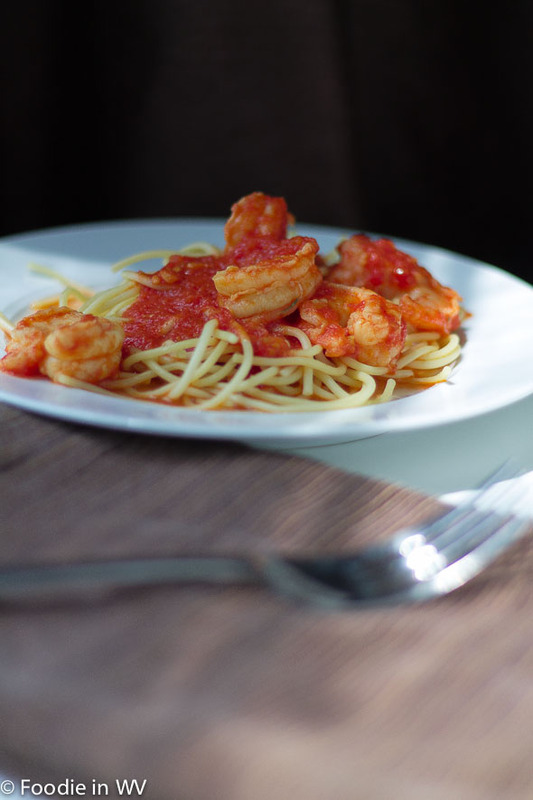 For the recipe go to Spicy Shrimp Marinara. Yum, this looks sooooo good! I love shrimp. It's one of my favorite foods, hands-down. This looks really good and I will definitely be keeping this one in mind! This seems like something that would be good to serve at a dinner party. Easy and delicious. It would be great at a dinner party since it would take very little time! Nom Nom! Love shrimp marina! Good thing it's lunch time now I am hungry! Thanks :) Going over to add my link! I agree, we try to eat it frequently since it is low fat and high in protein. I have a few shrimp lovers in the family. I'm not really a shrimp person, but this looks like something I could try for everyone so they get a treat. If shrimp is prepared right it is delicious. I have had a lot of shrimp dishes that I haven't cared for though even though I love shrimp since the dish was made so that the fishy taste was too strong :) If you end up trying the recipe tell me how it turns out!